107. Pholiota aurivella (Fr.) Kummer, Der Führer in die Pilzkunde, p. 83. 1871. Agaricus aurivellus Fries, Syst. Myc. 1: 242. 1821. Hypodendrum aurivellum (Fr.) Overholts, North Amer. Fl. 10: 279. 1932. Illustrations: Text figs. 222-224; pls. 49-50. Pileus 4-16 cm broad, campanulate to convex, often broadly umbonate, when young more or less uniformly ochraceous orange to tawny, at maturity more uniformly tawny, at first covered with large appressed spot-like scales which may disappear and when wet may become more or less gelatinous, cuticle viscid or gelatinous. Context yellow, firm. Lamellae adnate, sinuate-adnate, or emarginate, pale yellowish, becoming ferruginous brown, close. Stipe 5-8 cm long, 5-15 mm thick, yellowish or yellowish brown, central or eccentric, floccose above the annulus, fibrillose below and increasingly scaly downward, the scales fibrillose and recurved, dry, equal, solid. Spores 7-9.5 (11) x 4.5-6 µ, smooth, apical pore distinct but apex not truly truncate; in face view broadly elliptic, in profile broadly oblong to obscurely bean-shaped; in KOH dingy cinnamon-color, in Melzer's reagent darker reddish-tawny; wall about 0.25 µ thick. Basidia 24-28 (30) x 4.5-6 µ, 4-spored, hyaline to yellowish in KOH and Melzer's reagent, narrowly clavate, some with hyaline refractive amorphous particles, some with rusty-brown content in KOH (clearing somewhat on standing) and some hyaline and homogeneous. Pleurocystidia 30-45 x 4-7 µ, mostly fusoid or branched once or twice near apex (rarely appearing as having 3-4 coarse sterigmata, 3-4 µ at base (but no spores ever seen attached); content hyaline to partially filled with solidified colloidal material or with refractive particles cark brown in Melzer's (but not with a characteristic refractive inclusion as in chrysocystidia). Cheilocystidia 26-35 x 5-10 µ, subfusoid with obtuse apex to fusoid-ventricose and obtuse, or versiform, wall at times thick enough to show as a double line. Caulocystidia none. Gill trama of floccose subparallel hyphae of elongate cells 5-15 µ or more diam., thin-walled, smooth, hyaline to yellowish in KOH and Melzer's reagent; subhymenium of narrow hyaline gelatinous hyphae curving from a central strand to base of hymenium-very indistinct at best. Pileus cutis a thick gelatinous layer of interwoven yellowish to hyaline smooth hyphae 2-5 µ diam. ; hypodermium of rusty brown hyphae (but color dissolving out and layer merely yellowish finally), hyphae 5-17 µ diam. Context hyphae hyaline and with "colloidal" content as revived in KOH, 6-15 µ diam., yellowish in Melzer's reagent, walls thin to slightly thickened and refractive in KOH. Clamp connections present. Habit, Habitat, and Distribution: On trunks and logs of hardwood (maple, basswood, elm, sycamore, beech, birch) and conifers, New York, North Carolina, Tennessee, Michigan, Colorado, Idaho, Washington, Oregon, New Mexico; Canada (Ontario); Europe, England; also reported from California (Overholts 1927), and Illinois (Harper, 1911); June-November. Observations: This species is marked by its viscid, yellowish to tawny pileus, with appressed spot-like scales, and a dry stipe with fibrillose, recurved scales which tend to be more numerous downward. 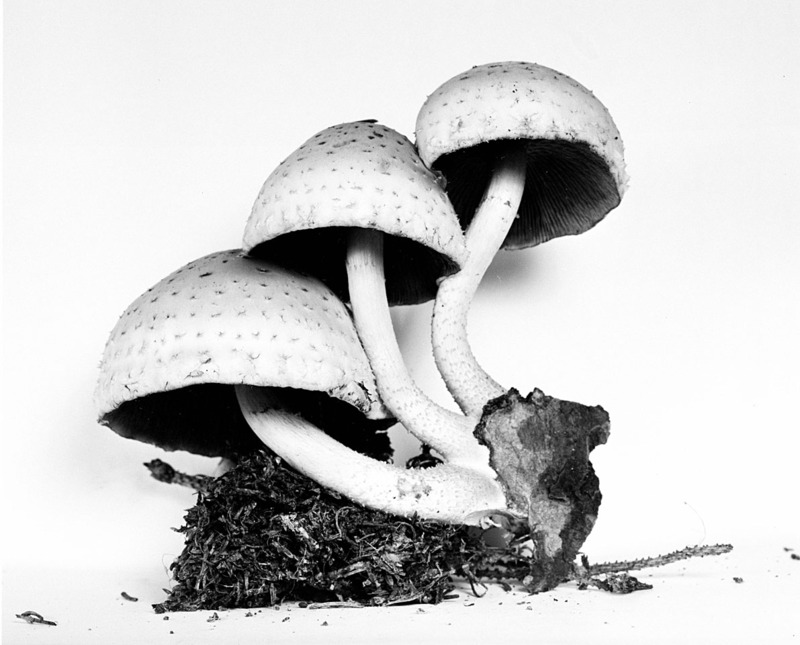 The spores usually do not exceed 9.5 µ in length, only rarely reaching 10-11 µ. Generally, it is not found at the base of trunks and stumps, but on them. Lange (1938) has proposed P. aurivella var. cerifera (Karsten) Lange for a variety which has a stipe with dense, recurved scales, which at first are whitish but soon brownish from the base upward. We have not distinguished this variant here in North America. P. caespitosa might appear close but it has yellow scales on the stipe and when young a whitish pileus. The brown bodies in the hymenium can be basidia, basidioles, or cystidia, so a distinction between cystidia and basidia on colored content is not made here. The pleurocystidia are a distinctive feature of the species, but revive poorly. Moser's (1950) report of P. squarroso-adiposa, to judge by the spore width, applies to P. aurivella. The microscopic data given in the following account are from a specimen from Derek Reid, collected at Berkhamsted, England. Oct. 27, 1955. Spores 7-10 (11) x 4.5-6 µ smooth, apical pore distinct but apex not truly truncate; shape in face view broadly elliptic, in profile broadly elliptic to obscurely bean-shaped, color in KOH dull tawny, in Melzer's reagent reddish cinnamon; wall about 0.4 µ thick. Basidia 25-30 x 6-8 µ, 4-spored, clavate, hyaline in KOH and yellowish in Melzer's reagent. Pleurocystidia embedded, 26-34 x 7-12 µ, sharply fusoid to clavate mucronate, wall thin smooth and hyaline; content "empty" except for a small at times poorly formed refractive inclusion. Cheilocystidia 22-33 x 5-9 µ, subfusoid, subfilamentous or fusoid-ventricose; walls smooth, yellow to hyaline, thin; content homogeneous, yellow to hyaline. Caulocystidia in tufts (20) 33-65 x (8) 12-20 µ, clavate to vesiculose-pedicellate; walls smooth to roughened, yellowish to hyaline; content-"empty." Gill trama of mostly floccose hyphae subparallel and with long greatly inflated (20+ µ) cells, walls smooth, slightly thickened and refractive; hyaline; subhymenium a poorly defined layer of subgelatinous hyphae (on mature gills). Pileus trama with a thick gelatinous pellicle of hyphae 2-8 µ diam., content ochraceous to brownish in KOH, the layer dull reddish cinnamon near surface, yellow to hyaline in midportion; hypodermial region not sharply distinct from context. Context hyphae interwoven, cells with slightly thickened to thin walls (2 double lines if thickened), smooth. Clamp connections present. All hyphae inamyloid. It will be noted that no pleurocystidia with colored content (brown to red) were found in this specimen, but that typical chrysocystidia were, though in some the inclusion was not too sharply defined. In addition the caulocystidia were voluminous. If proved constant this combination of features may be indicative of an additional species. We refrain from describing another species at this time because we do not have sufficient data on the caulocystidia of the western American specimens and because we have seen both only in the dried condition. Material Examined: ALASKA: Baxter 8-1936; CALIFORNIA: Pusateri 25; COLORADO: Barrows 902, 1336, (MICH); IDAHO: Cooke 22069 (MICH); Smith 32030, 34208, 54694, 54695, 55258, 58331, 68714; Trueblood 270 (MICH); MAINE: Parlin 15260; MICHIGAN: Smith 3181, 21382, 71435, NORTH CAROLINA: Hesler 18170; NEW MEXICO: Barrows 105, 1498, 1498a (MICH); OREGON: Sipe 132, 224; Smith 19658; TENNESSEE: Hesler 9538, 9582, 12508; UTAH: McKnight F-144; WASHINGTON: Cooke 21922 (MICH); CANADA: BRITISH COLUMBIA: Tannhauser 10-26-48; ONTARIO: Bell (Tenn. 10274); QUEBEC: DAOM 45190; ENGLAND: Reid 27-10-1955; NETHERLANDS: Tenn. 23833; SWITZERLAND: Favre 9-10-48. 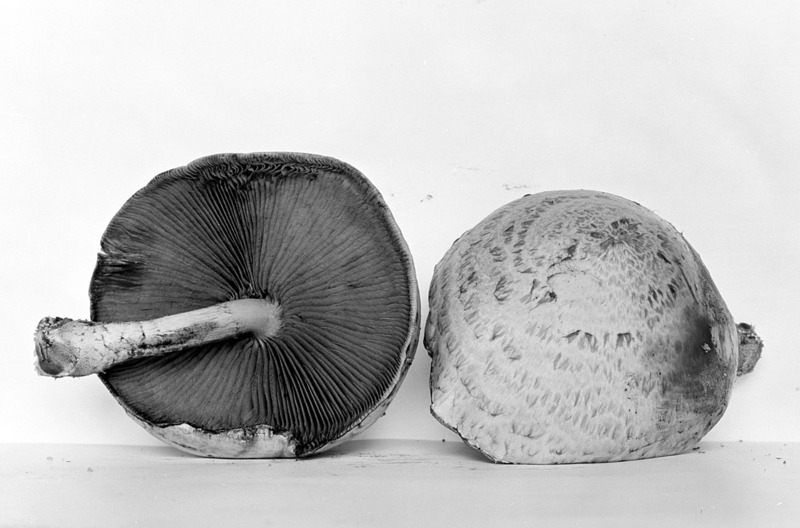 Cultured basidiocarps: Arend 1935, Harding 4 specimens 1951-1952.